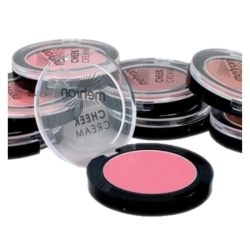 The Mehron C.H.E.E.K cream colors are perfect for use as blush for the cheeks. They are concentrated to make them easy to use for blushing, contouring, and highlighting. These creams are made to provide an easy and smooth application over both cream or cake foundations. Each cup contains .3 oz. of makeup.